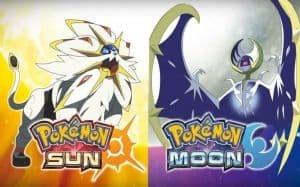 Why Pokémon Sun and Moon Is Accessible to Everyone | Nerd Much? Seven generations strong and Pokémon still manages to be one of the most accessible franchises to ever exist. While there are definitely gamers who have followed the series each step of the way, many of us haven’t. Many gamers haven’t played a Pokémon game in years and some haven’t played them at all. As for myself, I jumped straight from the Gen 1, Pokémon Red and Blue (US release: 1998) to Pokémon Alpha Sapphire (2014) which is just a revamp of Gen 3’s Pokémon Sapphire (2003). I’m still learning about legendaries, shinies, and the countless other changes the series has made over its 20-year history, but playing catch-up doesn’t feel like catch-up at all. Pokémon Sun and Moon manages to stand alone while being part of a long-running lore in a way that many other games within established franchises don’t. It avoids stagnation without over complication. In Pokémon games, you are always a kid aiming to become “the very best like no one ever was,” which is typically done by defeating gym leaders. In Pokémon Sun and Moon, there’s a slight twist on this. There are no gyms; instead, there are island trial challenges culminating in a final trial on each island known as the grand trial. As someone familiar with the series this was a refreshing little adjustment. It piqued my interest and curiosity, which is what you want in the opening of a game. And if you’re a newcomer you don’t lose a beat because everything is explained anyway. 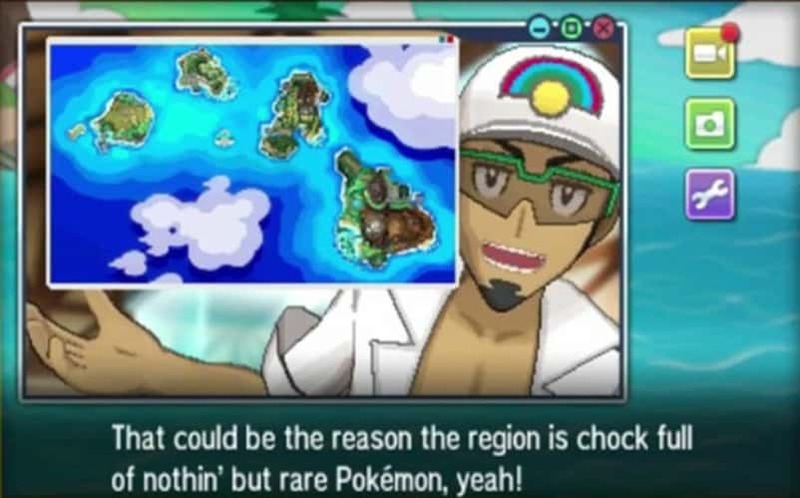 Pokémon Sun and Moon’s opening storyline places an emphasis on the Alola region, and the culture that surrounds it, as something new to the player (which it is). 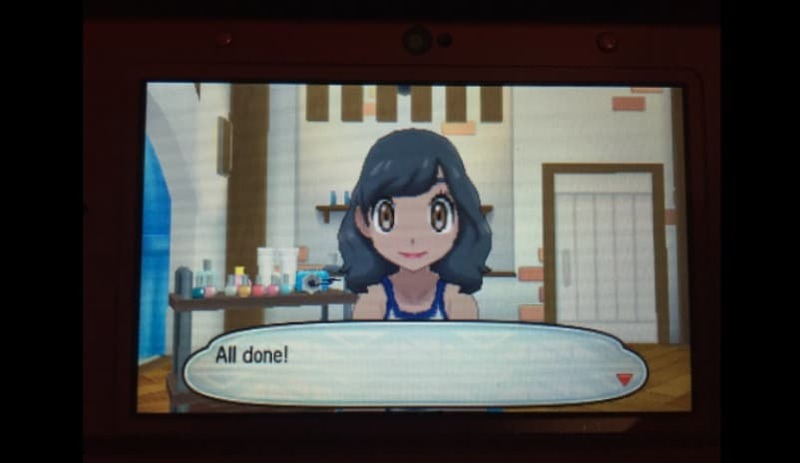 The start of Pokémon Sun and Moon manages to say “you’ve done this before, but this is a new adventure” but still explains everything you need to know in case you haven’t actually done this before. In this way, the game does an excellent job reaching its entire fanbase. 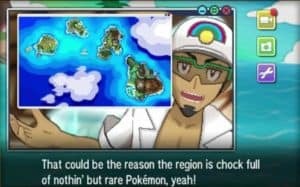 New game, new region, new whatever: Pokémon is still Pokémon. It’s all about catching them all, training, and proving your mastery–that in itself is appealing. Cynics may look at Pokémon as just another RPG or roll their eyes at its simplicity. But like many Nintendo exclusives there’s not much you can say because, damn, the formula works so well. To me, there was a moment early in the game that captured Pokémon’s appeal perfectly. And that’s exactly why people love Pokémon. Sure, there’s a wide range of answers you can get from fans: from complex explanations of the various Pokemon types to heartfelt stories personal anecdotes. And this is in no way discounting the intricacies and depth the series has to offer; but, at the end of the day, Pokémon is a cute and cool franchise. We all have different reasons for loving our little monsters, but the franchise’s straightforward and enjoyable experience is what makes its reach so expansive. While some gamers may roll their eyes at those “start of the game tutorials” it’s fairly short and explains most of what you need to know. After your first few battles, you get to explore the town a bit. Your friend, Lillie, guides you through the area and your map even has markers on where you should go next…but you don’t have to go right away. Granted, this early in the game you are limited to how far you can stray but if you want to spend half an hour walking through the tall grass and training before meeting Lillie in front of the clothing store, no one will stop you. While plenty of RPG’s have simulator game elements (especially in terms of character customization) the Pokémon franchise hasn’t always been big on dressing up your avatar. 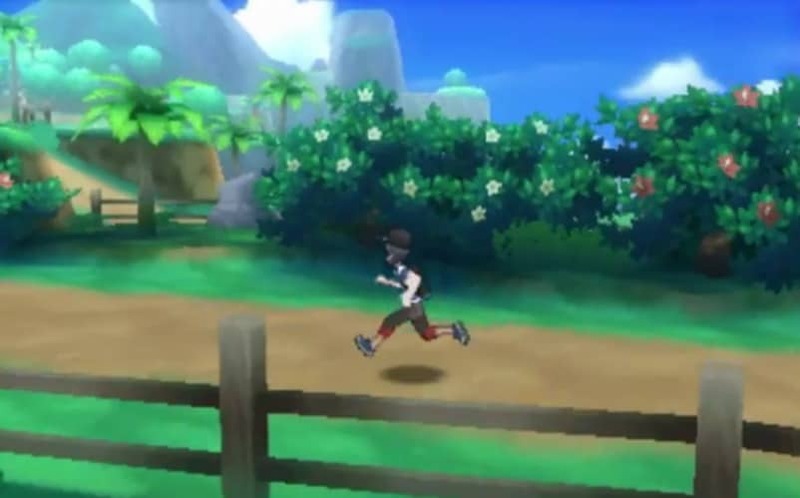 But in Pokémon Sun and Moon you’ll have plenty to do outside of catching and battling. There are some simulator elements it’d be wise to partake in: such as the post-battle Pokémon care option. 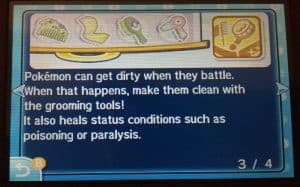 With Pokémon Refresh, you can dry off, clean up, or give medicine to your Pokemon after they battle. This especially comes in handy when Pokémon are, for example, put to sleep or poisoned in battle. Pokémon Refresh will save you time and money but if you’d really rather not you can just treat them with antidotes, heals, etc. the way you did in older games. Constantly using Pokémon Refresh, is more optional. 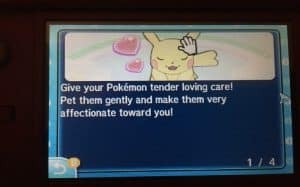 Sure it will help you if your Pokémon feel “affection, fullness, and enjoyment” but it’s not a big deal if you’re a little lazy on this front. As for myself, and many other players, I’m thrilled to be able to pet my Pokémon and feed them beans. 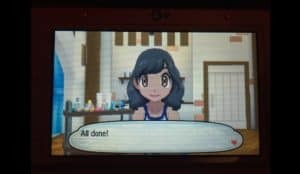 The animations are adorable and I feel more connected to my Pokémon already. Lastly, the completely optional sim element is shopping and visiting the salon. This is purely cosmetic but players who love avatar customization and/or simulator games will love this option. And just like that, the Pokémon franchise continues to catch every generation of gamers with each new generation it releases. Pokémon Sun and Moon, in particular, does this exceptionally well. 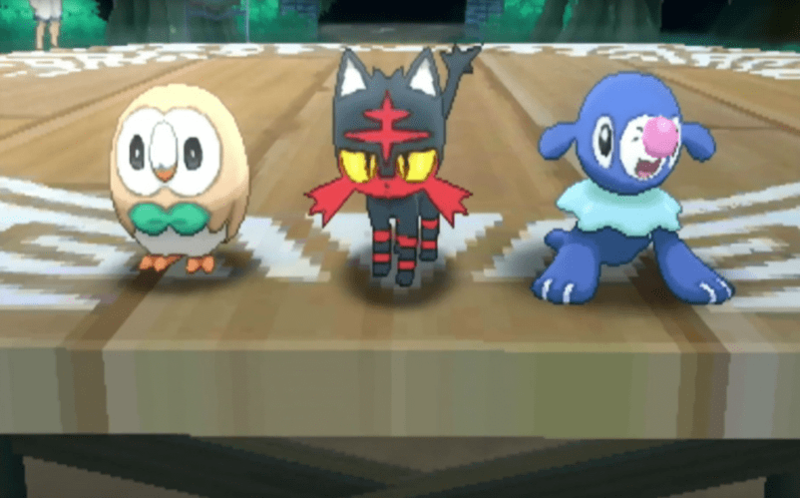 From die-hard fans to newcomers ready to see what the fuss is about, anyone can pick up Pokémon Sun and Moon and have a great time and I hope everyone does.